Quality has always been the center of our company's focus. As an expert in appliances repair, we know well that our service means a lot to those trusting our work. Appliances usually go unnoticed by everyone but look around you! Which place in Glendale doesn't have a fridge and which house in California doesn't have a washer? People don't spend all day in Griffith Park or in the office. At one point, they will be back at home and they will need to use their dishwasher, stove and dryer. They will go to dinner in a restaurant and expect to be served fresh food and cold beer. Everything is possible with well-maintained appliances! Appliance Repair Experts Glendale promises perfectly serviced appliances. We are specialists, knowledgeable and fully dedicated to the needs of our clients. Whether you need commercial or home appliance repair, keep your expectations high because our company will amaze you with its dynamics, speed and excellence. We have a very special team for your Glendale Appliance Repair needs and make sure our technicians are perfectly equipped when they are called for services. What distinguishes our company among the crowd is the total devotion of our company to each and every customer. We maintain all appliances with equal attention and are always meticulous in our work. It's not strange that every appliance service technician at our business is distinguished for his passion, commitment and knowledge. We select the people with whom we will work with in order to be sure of our perfection. Not only are our technicians impeccable as professional experts in Appliance Repair Glendale services but they are also impeccable in their manners. We work with the best, own the best tools and equipment, and are at your service for your needs. 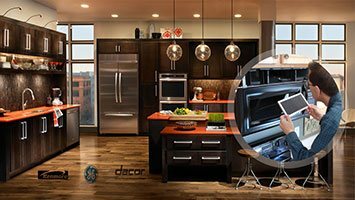 Next time you will need the best in kitchen appliance repairs, think of our company. If you want to avoid problems altogether, trust our company today. Call us for services before problems upset your life! We provide thorough preventive service, take care of all problems with speed, are discreet and true professionals, are masters in small appliance repair and are always available to our clients. We are the choice for you!